* Note the “Bottom line”: feature at the end of each segment. I have discussed in recent months my intention to host a webcast featuring principals, teachers, support staff, parents and students in Ward 4. Date: Wednesday, May 3rd from 6:30 P.M. - 7:45 P.M. I am seeking your help by requesting the active participation of all School Councils with the suggestion that your May meeting be held at the same time. This will be an interactive session whereby you may participate with questions and/or comments via email, Facebook and Twitter. Details about this procedure will be forthcoming soon. Format: Three basic questions will be sent out in advance as a basis for this interactive discussion. Bottom line: I am excited by this opportunity “to talk” education and look forward to this event. Anyone can participate. N.B. I will be pleased to help by collecting and delivering your lids to this class project. Start saving folks from now until Fall. The Ministry of Education expects school boards to implement a process towards both board and school improvement planning. The Ministry document entitled School Effectiveness Framework has been used as guide to help educators identify areas of strength, areas requiring improvement and next steps. Over the course of the past year, our school board team has worked to identify key areas of focus for the Upper Canada Board Improvement Plan. We have identified the areas of Literacy, Numeracy, and Assessment. Boards and all schools must have a plan to ensure that these goals are reached, particularly, in the area of student achievement. With regard to numeracy, reading, writing, mathematics and assessment, the UCDSB and each of its schools has a Theory of Action in each of these areas. Essentially, if we do this (a strategy in each of these areas of learning), then student achievement will improve. The Board and each school is in one of four stages: Planning, Acting, Observing and Reflecting. Each school is different. To conclude, the BIPSBA and SIPSA are strategies to improve student achievement. These strategies are being implemented at the Board level and in each and every school. Bottom line: The Board and all schools are aiming higher all the time. Bottom line: I am proud of the work of the students, staffs, School Councils and the communities-at-large at Meadowview and Sweet’s Corners. Over the past year, the UCDSB Board of Trustees led a comprehensive process to receive information from through an online survey of staff that was conducted between October 31 and December 1, 2014 and an online survey of students that was conducted between May 31 and July 1, 2015. An online survey of parents was also conducted concurrently with the above-noted student survey. The results from these surveys, provided as Attachment 1, are a starting point from which Trustees can begin to understand the impact of the work that we are undertaking together on behalf of the students and communities we serve. Bottom line: These surveys were initiatives of the Trustees. With the results and the assistance of our senior staff, a new tone has been established. That the Upper Canada District School Board direct the Director to bring back a report in the month of February regarding what measures will be in place to manage expenses such that the Revised Deficit of $2.3 million be maintained and to achieve the original deficit of $1.5 million projected for 2015/2016. In response to that directive, the Director and Senior Administration embarked upon a collaborative and comprehensive review of all 2015-16 expense budgets with the goal of identifying any and all opportunities to reduce planned spending from February 2016 through to the end of August 2016. Bottom line: The system is getting more and more lean. Trustees are actively monitoring revenues and expenditures without affecting students and the classrooms. Good afternoon and Merry Christmas. Below is a link to my December newsletter. Bus Driver Awards were presented on January 8, 2014 to three of our great bus drivers. Congratulations to the following UCDSB bus drivers who were recognized for their quality service to our students: Driver of the year: Carolyn Klitbo (Howard Bus Lines), recognition recipients: Norma Fyke and Arie Oosterman (Stock Bus Lines) and Jonathan Allen (Clark Bus [MJ1] [MJ2] [MJ3] ). Unfortunately, I am unable to find the photo with Norma Pyke from Stock Bus Lines. I was pleasantly surprised to meet Norma whom I had taught many years ago at Seaway DHS in Iroquois. Special Education Advisory Committee: a) Gifted Program changes: The main focus of the meeting was a presentation by Chad Brownlee, Principal, Section 23, Tania Mason and Jane Veninga, Student Engagement Teachers. These three staff members made a presentation on the UCDSB Gifted Program and its changing focus of the new model. The thrust is to move from specific enrichment events to a more comprehensive view of the student’s journey. The key is finding the right model for each student. More expansive programming is being examined. Several strategies such as compacted learning, acceleration and utilizing the needs of the learner are being utilized. The team presented an insight into the use of a technology model in use among identified students from across the Board. Tania and Jane modelled the first unit and it is becoming sustainable unto itself with the students’ work. b) Report of reps: Representatives presented reports a) the Premier’s apology to Former Residents of Regional Centres For People with Developmental Disabilities; b) the Parents Lifeline of Eastern Ontario (PLEO) and a presentation by Dr. E. Athen MacDonald on the topic of epilepsy. Kory Earle addressed the Premier’s apology for which he was present in the Legislature and noted that it was indeed one of the Premier’s finest moments. Her sincerity on behalf of Ontarians toward the former residents of the Huronia Regional Centre and the Rideau Regional Centre in Smiths Falls was welcomed by all present. A copy is attached for information purposes. Performance Focused Budgeting (a process whereby the Director, the Superintendents and Department Managers will report to the Board). So, back to the Net Promoter Score. The NPS is not meant to measure the popularity of a product or organization; rather, it is used by many larger organizations as a metric to measure the loyalty that exists between a Provider, i.e. the UCDSB and the consumer (our public). The NPS is based on one direct question: “How likely is it that you would recommend the UCDSB to your friends or family?” One can track these responses and get a clear measure of the UCDSB’s performance as seen through the stakeholder’s eyes. The goal is to motivate an organization to become more focused on improving services with consumers. These four measures have been almost 100% completed. This year’s report indicates that the UCDSB should a) continue to focus on those close to the Board (those who have attended or have family attending one or more of our schools) and b) leverage positive experiences and create a communications platform to address concerns around such key areas as school funding, educational programming, class sizes, staffing and bullying. Three specific thrusts by Trustees and Administration will be three separate surveys of staff, students and graduates. Williamstown Public School: Further to the School Success Plans as described in the sixth bullet, the second school to present its plan was Williamstown Public School lead by Principal Jennifer Charbonneau. Last month, we heard from Lombardy Public School. Trustees are not interested in a glazed version of the life in a school but rather seek to learn more about the real story: the successes, the failures, the challenges, the levels of student and parent involvement, wellness of staff, the needs, examples of the school goals and school initiatives. Full-Time Kindergarten Registration: This process is underway. Parents are encouraged to register their child (children) in one of three ways: a) registering on the website; b) downloading the registration form from the website and sending it in to the Board or School or c) going to the school in person. Information is in the local media. The Upper Canada District School Board is pleased to be able to offer this opportunity to all children in our Board. This initiative is one which I wholeheartedly support. Athens Heritage Society: I was pleased to work with President Kathryn Hudson and the members of the Athens Heritage Society in this recent project commemorating the great role that Athens (formerly Farmersville) played in the past educational endeavours of this area. It is a role that continues to this day. The signs have been installed but have yet to be officially unveiled. The research into this project is absolutely fascinating. Stay tuned. Delegations to Gananoque Intermediate Secondary School: I was pleased to be part of the welcoming committee for two recent delegations to GISS from the Nechako Lakes School Board from B.C. and our neighbouring Board, Ottawa-Carleton. Both delegations consisting of superintendents, principals, teachers and parents were conducting their own in-site investigation into our Grades 7-12 model. Principal Chris Boston and his staff did a fabulous job to make everyone feel welcome and informed. Meadowview Public School Christmas dinner: The School Council, parents and volunteersdid a super job of feeding every child in the school a delicious Christmas turkey and ham dinner. In was pleased to be able to assist and be part of the spectacle. The students were especially well-behaved and grateful. This group just ticks on like a well-oiled sewing machine. Audit Committee: The Audit Committee comprising staff, Trustees McCrae, MacDonald and McAllister and two external members, Barry Curtis and Linda Harrison (both Chartered Accountants) has been tasked by the Board to review and monitor the status of a number of high-risk policies. Part of the process has been the selection and development of a tool to do so. Consequently, the following policies were identified for deeper scrutiny: Students Safe Arrival, Freedom of Information, Bullying Prevention and Intervention, Employee Performance Appraisal, Fees for Learning Materials and Activities, Student Transportation, Fundraising and Standards of Supervision, Social Media and Conflict of Interest. Student expulsions have decreased. (P.S.) I am a member of the Discipline Committee which supports or defeats the recommendations from school principals in a quasi-tribunal setting. I am impressed with the care, consideration and accommodation which we make for students who are suspended or expelled. Professional development is a high priority. In my opinion, this report was the most informative yet and reflective of the activities of all aspects of the Board in the past year. It has been reported accurately that the revised estimates reflect a drop in income due to a number of factors, i.e. unexpected enrolment numbers. This was unforeseen in June when the budget was set. There is no doubt that this is problematic. However, Trustees and staff have been dealing with this matter at the last two meetings. The requisite adjustments are being made and the Director has been asked to present an update to the Trustees within a few weeks. Social media: I enjoy following the activities of all our schools on Twitter and Facebook. THE ACCOUNTABILITY FRAMEWORK COMMITTEE The Accountability Framework is an initiative of the Trustees of the Upper Canada District School Board to fulfill their duties under the Education Act. Communication: To facilitate parent involvement, student achievement and public confidence, communication must be clear, purposeful, effective, targeted and branded. Resources: To create an engaging learning environment, support student achievement, and sustain public confidence, resources must be allocated equitably, responsibly, and timely. Educational Programs: To provide relevant and challenging experiences, educational programs must be delivered by qualified, innovative, caring staff, supported by pertinent and engaging professional development. as a basis by which to examine all issues. We call this new step…..
 Graduation rate: how close are we in achieving the 90% graduation rate o Status: Some are there, others are not.  Net Promoter Score: Do our communities recommend our Board o The first survey was conducted last year and the second is to be presented to the Board this month.  Graduate Study: How our graduates are succeeding o Status: We are searching for an effective method to achieve this goal.  Student Culture survey: What is the self-evaluation of students` spiritual, mental and physical wellness  `Tell Them From Me` surveys have been utilized in schools for years. Data from these surveys will be reported with the goal of correcting and improving. So far, so good. But how do we know how we are doing unless these factors can be measured? That is the key! Therefore, we had to take our Board TO THE NEXT LEVEL. The Trustees realized quickly that they needed more information to assess and evaluate these elements. Our work is progressing but much remains to be done. development.  Performance-based budgeting: The Director, Superintendents and Department Managers will report directly to the Board on an annual basis. o This reporting practice is being used each year during budget deliberations. THIS IS A WORK IN PROGRESS… Trustees are taking this project very seriously and it is an item on every Board agenda. I would appreciate your comments. Chris Hawthorne, Principal of Lombardy Public School, presented his School Success Plan to the Trustees on November 27th. It was a fine “state of the union” address. Chris outlined the successes, challenges and future steps being taken by him, his staff and the broader supportive community to achieve their goals. Be it resolved that the Director develop strategies using the $300,000 allocated by Trustees to support the arts to build teacher capacity in the Arts K-6 program with a report back to Committee of the Whole in January, 2014. Motion by John McAllister, second by Caroll Carkner. Actually, the Director reported back two months earlier than scheduled. The result is a solid, long-term (6.5 years) plan to reallocate annually the $300,000 allocated to the arts in the budget in support of building teacher capacity, conducting an inventory of human and physical resources, identifying gaps and coordinating professional learning. In short, two Program Resource Teachers (music qualifications) will be engaged to formalize the project plan. I believe that this is a very positive step which will reap many rewards for improved instruction in the arts at the K-6 levels especially. The basic thrust is one of inclusion, belonging and the development of resiliency to help our students cope and thrive in spite of challenges.  Our desired state would be a Board of Education in which all students and staff understand that we all belong!  This desired state would support and promote students to talk openly about anxieties as well as their individual differences.  Our desired state would have students and staff knowing exactly how to go about seeking help and support should issues arise.  This year we have become part of Cohort 3 of the Provincial Mental Health Assist. This means that we have been able to hire a Mental Health Lead and we have a Mental Health Assist Coach for the Eastern Region. We have recently hired Russ Larocque to the position of Mental Health Lead.  Following his orientation, Russ will begin to complete a Resource Mapping Exercise (at the System and School level) to determine existing strengths and needs throughout the Board in the area of mental health.  The plan as we move forward will be to begin to develop a draft UCDSB Mental Health Strategy that aligns with our overall school board plan, and that identifies strengths, needs and priorities in the area of mental health and well-being. A goal of this work is also to select and support evidenced-based mental health promotion and prevention programs across our Board.  We are continuing our work with Dr. Santor and MyHealth Magazine, who is bringing training to the classrooms in our schools to increase Mental Health Literacy with students and staff.  Staff Capacity Building is ongoing through courses provided by the Canadian Mental Health Association. These are: o 1) a two day Mental Health First Aide Course for school staff and o 2) the Two Day Applied Suicide Intervention Training.  Our community partnerships continue to develop in our efforts to build on the success of Checkered Flags, and make it more readily accessible through our Board website and a Checkered Flags website.  We are also working with many community partners and our co-terminus Board on a Suicide Protocol document. December 3rd is recognized as the International Day for People With Disabilities. The Special Education Advisory Committee in October recommended that the Board recognize this special day. A motion of support was passed and an on-going course of action is in the planning stages. A video has been prepared which tells the stories of individuals in our Board who have overcome their disabilities and are shining models for all of us. I am a member of the Audit Committee which is composed of three Trustees, two external members and staff. The affairs of the Board are scrutinized in many ways but mainly by a) an independent external audit; b) an internal audit and c) a Ministry- appointed regional audit which examines particular issues. The Board accepted the recommendation of the Audit Committee that the 2012-2013 audited statements be adopted as presented. An important task that has been handed to the Audit Committee by the Board is an assessment of its 75 + policies with the view of determining the ones which pertain to areas of high risk and how well that risk is managed and monitored. All of our schools recognized this event by conducting various activities to raise awareness of the roles we all must play to minimize bullying of every kind. Helping students to develop resilience is a key goal. Good work! I have met on two occasions with members of the Athens and District Heritage Society. 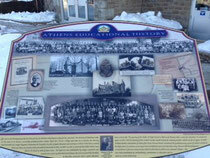 Several weeks ago, the Executive met to unveil the draft designs of two interpretative signs which showcase the proud history of education in the Athens area. Without giving away any secrets, the proposed design is remarkable, inspirational and revealing. Stay tuned. The UCDSB is pleased to be as community partner in this project. December and winter (though is it not still Fall???) are upon us and Jane and I would like to wish everyone a joyful and Merry Christmas. A partnership with the Dr. Darcy Santor, The Provincial Centre of Excellence for Child and Youth Mental Health at the University of Ottawa, to provide in-depth workshops with a target group of Grade 7-9 students. A partnership with the United Way to create awareness by funding local peer speakers in schools. Professional development for our staff using ASIST, Safe Talk, Mental Health first Aid Training and the Checkered Flags document. A student/staff survey based on best practices to determine the needs and gaps. A communications campaign (“Growing The Green”) using the three-tiered level of intervention with a focus on the first stage of developing awareness to de-stigmatize issues mental health and grow mental health literacy. The actions of the Board are augmented most importantly in each of our schools. Notably, last year, the Movement For Improvement was a substantial effort to raise awareness about bullying and the resultant negative consequences. The anti-bullying app is being investigated by our Board at this time. You may download it for free. It is called HWDSB Tip-Off. at Itunes. The purpose of this session was to explore a more positive, holistic view on child and youth development and how the role of parenting can focus on strategies that create a coordinated sequence of positive experiences that nurture the essential core character competencies essential for sustainable resilience. Rather than the traditional perspective of parenting with a problem orientation and risk focus, the principles of a strength-based practice and resilience are outlined as a more effective way for parents to understand and develop the strengths and capabilities of their children. The province is now in Year 3 of its Mental Health Strategy, and we have now come on as a participant at the provincial table and have received funding to hire a Mental Health Leader in our Board. This summer, David Armstrong, Alison Inglis and myself interviewed applicants for this position. Unfortunately, the person we offered the position to had a change in family circumstances and could not relocate to our Board. Hence the position has been reposted for the last several weeks, and we will be interviewing again next week. As the Superintendent with the responsibility for the Mental Health charter, I was invited to attend an information session in Toronto in mid-September for all Boards new to the strategy (most of the Eastern Ontario Boards were part of this). Last week, we returned to Toronto where every board participated in a meeting that helped to outline what has been successful to date across the province, and where we see this strategy going. It is very exciting to finally be a part of these discussions. The provincial mandate mirrors many of the discussions that we have had locally…..such as starting slow, looking at what schools are already doing, increasing staff capacity around Mental Wellness in students, making referrals to partner agencies for “treatment” components, and most importantly, incorporating this work into the systems and structures that we already have in place in our Board. On the local front, some of us are involved with a Youth Equity Forum in North Grenville on October 23rd. This forum will promote our “You Belong” theme, and will have an LGBTQ focus for the day. A dynamic team of teachers, principals and system staff are involved in getting this first time event off the ground, and there is an opportunity for at least 15 students from every Grade 7 to 12 school or high school attend. We are continuing to work with Darcy Santor, looking embedding his training into classroom settings (ie. Health classes and civics/career classes) at the secondary level. More to come on this. Finally, CMHA of Leeds and Grenville are looking to partner with us to do Mental Health First Aid Training with high school staff in Leeds and Grenville. Last year, the program focused on Link Crew, the delivery of mental health and anti-bullying measures being taken by the Board. Local Government Week was last week Oct. 20-26th. I met with Mayors Frank Kinsella (Leeds and 1000 Islands), Roger Haley (Front of Yonge) and Executive director Tim Mills last week to explore a deeper partnership between our International Learning (Upper Canada Leger Centre for Education and Learning) and the efforts for economic development by these local municipalities. Carrie McCadden (Educational Assistant, Russell Public School) – Carrie has been very creative in incorporating the use of Ipads and apps into the curriculum to engage students in the learning process. Heather Snider and Tanya Mason (Teachers – Frankville Office and Glen Tay P.S.) – What began as an effort to reach out to challenged students, their work soon spread to all students. They have developed innovative practices using technology, pedagogy and traditional teaching tools. They were the first to conduct research into interactive white boards and, as a result, have been recognized across Canada and in many countries, have been publicized in several journals and their work is being replicated in other boards. Monique Coe (Teacher – Toniata P.S.) – Initially, her work began with the use of headphones for hyperactive students. This adaptive teaching/learning soon spread to the reconfiguration of her traditional classroom featuring standing desks, desks removed, kneeling desks, balls, etc. The whole environment of the classroom was changed. To update the Board of Trustees on recommendations, as outlined in a report to the Board on April 24, 2013, regarding the Kemptville Public School incident. On Thursday, March 21st, 2013, a junior kindergarten student at Kemptville Public School fell asleep on his bus on the morning ride to school. He remained on the bus all morning, unnoticed by the bus driver until approximately 12:45 pm, when he was found by the bus driver and immediately returned to his home. His parents received no contact notifying them of his absence from the school. Director David K. Thomas ordered a full review of the incident, which was to include recommendations to be brought to the Board of Trustees. Click here for the recommendations carried at the meeting of April 24, 2013. That all buses that transport UCDSB students be equipped with an electronic “child check” system by September 1st, 2013. STATUS: Completed. All school buses that transport UCDSB students are now appropriately equipped. That the UCDSB continue to work with STEO to review bus safety and consider further improvements to aid drivers, including the installation of video cameras in all buses by September 2014. STATUS: Ongoing. STEO has made significant strides towards improving driver education regarding safe arrival, the use of the child-check system, and the importance of working with school staff to ensure the safety of our students. STEO is working towards outfitting the entire fleet with video cameras by September 2014. That the standardized format for safe arrival protocols be reviewed and amended by September 1st, 2013. STATUS: Completed. A formal review of procedures was completed in July of 2013. A draft procedure was given to all schools in August, and the final procedure was approved by Strategic Council on September 11, 2013. (please see attachment). That the new Family Portal system, as it becomes operational in the 2013-14 school year, be considered as an augmentation to school-home communication as it relates to safe arrival and attendance. (Please note – this will not replace the importance of speaking to an adult in cases of unexplained absence). STATUS: Ongoing. The Family Portal is in development and is expected to be piloted in our Board in early 2014. That current practice of school attendance tracking and input methods be reviewed and more efficient electronic means of data input be investigated. STATUS: Initial discussions in progress. That safe arrival procedures be clearly detailed in the operational messaging of the Board in September communication with principals, and emphasized centrally throughout the school year. This message must stress the priority of safe school calls in all school offices at the start of the school day. STATUS: Ongoing. Safe arrival procedures were clearly communicated to all school administrators in August and again in early September. A quarterly review of these procedures (along with other operational procedures that pertain to student safety) will occur throughout the year. Essentially, this is an effort to use certain measures to gain a sense of the success of the Board’s strategic plan. This is an intense but necessary effort on the part of the Trustees to fulfill their roles as good stewards. International Day For People with Disabilities (December 3rd): Upon the recommendation of the Special Education Advisory Committee, the Board approved motions to recognize this day and asked the Director to develop a long-term plan to recognize exceptional UCDSB individuals with disabilities. Student Trustee Tyler Harbers commented on: the meeting of the Student Senate, a Lync live demonstration for student senators, the appointment of four house leader positions at the Senate meetings, the revised Senate bylaws and a recent and very popular session on inclusion and Youth Equity. Goal of STEO is to use all vehicles at a high capacity rate which is currently approximately 80%. Important distinction: “shared” busing means students of CDSBEO and UCDSB ride the same buses at the same time. From 2010/11, 2011/12, 2012/13 and 2013/14, that rate has increased from 2%, 2%, 2.5% and 7% for each of the years listed respectively. “Double” busing means students are riding as separate groups on same buses (double runs). From 2010/11, 2011/12, 2012/13 and 2013/14, that rate has increased from 3%, 4%, 8% and 18%. The STEO Report states: “From the statistic “above”, you can see the department has dramatically increased the sharing of vehicles between the boards.” (since inception in 2012). The Board passed a motion at the Oct. 23rd, 2013 meeting asking STEO to undertake a feasibility study to accomplish the shared busing targets in a shorter period of time. Policy 101 was approved. This policy outlines the procedures and process in any evaluation this present and any future Director. Oct. 28: GISS School Committee Meeting 6:30 P.M.
Oct. 28: Parent Involvement Committee Parent Forum Kemptville 6:30 P.M.
Oct. 29: Discipline Committee Hearing, Cornwall 4:00 P.M.
Oct. 30: Living Well Focus Group Oxford-on-Rideau 1:30 P.M. Please contact me for further information or questions about any of the above topics. As discussed we are excited to announce the opportunity for Parents and Community Partners to attend an evening with Wayne Hammond, on Thursday October 10 at North Grenville DHS (Cafetorium) from 6:00 - 7:30 pm. Light refreshments will be served. Below is wording you may wish to use to engage and share with your parent and community. Understanding and purposefully nurturing a child’s ability to navigate and negotiate life’s challenges in successful ways is the goal of all parents. But in light of the many risks and threats our children face, embracing a parenting model that focuses on what is “strong” as opposed to protecting our children from what might be “wrong” is not a natural inclination. It is about preparing our children to thrive no matter what the challenge, as opposed to just trying to survive. The anti-bullying app is being investigated by our Board at this time. You may download it for free at Itunes. It is called HWDSB Tip-Off. Thank you for the kind comments about the Upper Canada TV production which I organized last Monday evening. Your suggestions and comments are very welcome. Local Government Week is Oct. 20-26th. I am meeting with Mayors Frank Kinsella (Leeds and 1000 Islands) and Roger Haley (Front of Yonge)next week to explore a deeper partnership between our International Learning (Upper Canada Leger Centre for Education and Learning) and the efforts for economic development by these local municipalities. Lots of meetings coming up. 1. Trustees’ Initiative – “Next Level Driven” Accountability Framework Workgroup: I am pleased to be part of workgroup which is examining a strategy enabling Trustees to be better stewards of the Board’s resources. The Board is guided by its multi-year strategic plan. Is it working? Is it effective? We are determined to find out. After much research, study and discussion, we have decided to judge the four pillars of the strategic plan (Communications, Resources, Educational Programming and Wellness) using seven key results indicators: the Board’s graduation rate, a net promoter score, high school exit surveys and graduate study, student culture survey, staff culture survey and performance-based budgeting. This data, hopefully, will provide us as Trustees with the necessary information to fulfill our mandate. It is a long but necessary journey. 2. Cafeterias: Secondary school cafeterias continue to present viability concerns due to constraints imposed by the new food guidelines and other factors. The Board decided: a) to allocate funds to modernize equipment, update dining areas and make them more appealing and less “cafeteria/institutional” looking and b) to re-negotiate agreements on more favourable terms in order to retain services. 3. Accessibility for Ontarians with Disabilities Act: The goal of the Accessibility for Ontarians with Disabilities Act, 2005 is an Accessible Ontario by 2025. The Board is examining the accessibility standards in five areas which will lead to full compliance. 4. Labour relations: There is a duty to engage in some local bargaining to tidy up loose ends created by Bill 115 and the negotiations between the Government and the unions. The more important question pertains to how collective bargaining will unfold in 2014. The UCDSB has been preoccupied by the need for a better decision-making structure to ensure that a modern process is created to ensure that students really are put first and that their achievement takes priority. 5. Trustee Activities: It has been a busy spring with School Committee meetings, talent shows, fundraising dinners, Coop luncheons, employee recognition celebrations, graduations, meetings with Principals, committee and Board meetings and budget deliberations. 6. Budget 2013-2014 time: The Trustees have been deeply involved in the budget process. Each major department has made or will be making a presentation to the Board outlining their allocation of funds, the challenges, pressures and risks of projects. Increasing demands and declining enrolment (cutbacks) are presenting daunting challenges. 7. Full Day Kindergarten: For the past several years, the UCDSB has been unrolling this major program. This schedule has been accelerated this year to ensure that each elementary school in the Board will provide this valuable initiative as of September, 2013. 8. Communication and Relationship Management Plan: Staff presented an update on this three-year plan in five major areas. Key improvements have occurred in: improved relationships with local media, targeted use of social media as a communication tool for communities (and training), finalization of crisis/critical incident plans, dramatically reduced spending on print ads, standardization of promotion/branding, fresh school websites, Upper Canada TV which allows extended family involvement in school and student activities and improved budget planning. 9. Student Travel Planning Pilot Project: The Board heard a recent presentation by Susanne Rivard, a representative of the partnership between the Upper Canada District School Board, the Leeds Grenville & Lanark District Health Unit, Communities Alive, and Green Communities Canada. This is a community-based, comprehensive approach to dealing with travel-related issues at schools. It is designed to increase local ownership of Active & Safe Routes to School by engaging stakeholders that include school boards, municipal transportation planners and engineers, public health, police, parents, students and school staff. School Travel Planning undertakes research to assess the barriers to active school travel and uses this knowledge to develop and implement action plans. The involvement of local stakeholders is an important step to ensuring the sustainability of active school travel activities (Green Communities Canada, 2012). There are two pilot schools in Upper Canada; Westminster Public School and Naismith Memorial. In addition to the Upper Canada District School Board, we currently have commitments from the Leeds Grenville & Lanark District Health Unit, Brockville Police, Safe Communities, Brockville Cycling Advisory Committee, Mississippi Mills Cycling, Ontario Provincial Police, Lanark Leeds and Grenville Healthy Communities Partnership with support from the YMCA, Every Kid in Our Community, Heart and Stroke Foundation of Ontario, Girls INC, Family and Children's Services. 10. Audit of Policies and Procedures: The Board has referred the policies and procedures of the Board to the Audit Committee with a view of determining which, if any, of the above might be outdated, redundant or unnecessary. I welcome questions and comments on any of the above items. Bill 115 did not put students first. On the contrary, this legislation created predictable havoc, anxiety and confusion culminating in the withdrawal of voluntary services, the loss of many extra-curricular activities, rotating one-day strikes and walkouts and the disruption of normal school operations. The December 31st deadline came and went. Local negotiations had failed (once again, predictably – hard to bargain with two arms tied behind our backs) and, on January 20, 2013, the Minister imposed the terms and conditions of Bill 115 on boards of education and unions. Local bargaining was now dead. • no final orders are issued because ETFO’s Charter challenge to the definition of strike in the Education Act remains to be litigated – but a direction to post a Notice to Employees is issued clarifying the stage that this litigation has reached and the position of ETFO (at least up until it withdrew its “advice” to members on March 26, 2013) with respect to the participation of its members in the withdrawal of these activities. a) Did the UCDSB win its case? The interim ruling, subject to a review of the charter, is positive in favour of the Upper Canada District School Board. b) What does it mean? Good question! The Ontario Labour Relations Board (OLRB) Chair Fishbein ruled the union’s (ETFO) counsel to withdraw activities falls within the definition of an illegal strike given that a valid collective agreement was in place at the time. c) How can such a contract be considered valid? Another good question! It is valid because the Government via Bill 115 said it was. d) Does this mean teachers must perform extracurricular activities? Absolutely not! The participation in voluntary activities remains an individual choice. e) Why, then, did the UCDSB and the Trillium-Lakelands District School Board make this appeal to the OLRB? Both Boards were seeking clarity in this unusual type of labour disagreement at the time of filing the appeal, now and in the future, in order to guarantee the normal operation of a school board, its schools and school programs for the benefit of its students and employees. f) Why did other boards in the province not do the same? Good question! g) The teachers, unions (and the UCDSB) fought passionately against the imposition of Bill 115 as it imposed a contract and removed local bargaining rights? Is that true? Yes it most certainly is. The UCDSB through its Chair Pietersma voiced this similar opinion very publicly to no avail to the Premier, the Minister of Education and the Government. h) Will this ruling set a precedent across the province? Yes though it applies only to the two Boards who filed the appeal. i) What about all these negotiations between the Government and the unions? Your guess is as good as mine. The UCDSB and all other boards in Ontario are considered “the employer” under the Labour Relations Act and have a duty to bargain collectively with our employees through their various unions. The Boards, much to their chagrin, have been sidelined in this process. j) Were you, as Trustee for Ward 4, in favour of this action of the UCDSB? Yes, I was. Until Bill 115 was imposed, I spoke and wrote plainly against the Government’s actions and in favour of the unions’ and the Board’s position which advocated local bargaining. However, once the Bill was enacted and once the disruption to our schools due to the union activity were evident, I felt it incumbent upon me to support our students and parents and the “normal” functioning of school activities. k) What is happening now? The Minister Liz Sandals and Premier Kathleen Wynne engaged in discussions to mitigate the effects of Bill 115 and an agreement has been concluded between the Government and OSSTF. Similar negotiations are on-going with ETFO. l) Is this satisfactory? Yes and no. The OLRB decision and the agreements between the Government and the unions have provided a return to many of the extracurricular activities in our schools. On the other hand, the boards of education (the legitimate bargaining agents as employers under the Labour Relations Act and the Education Act) have been excluded once again from a process they will have to administer. Some local bargaining is now expected by the Minister and Premier. That Committee of the Whole direct the Chair to continue to work on the issue of the autonomy of School Boards along with the five (5) recommendations listed in the "Who is in Charge of the Schoolhouse?" report. 1. We should capitalize on our leadership in defending the autonomy of school boards by continuing to advocate utilizing our blog, social media, the Ontario Public School Boards' Association (OPSBA) and the media. 2. There is a need to educate our constituents and the broader public on the issue of eroding local autonomy. 3. There is a profound lack of understanding of how our legislative process works. 4. Create a process that will modernize our employment contracts to allow the dignity of all parties to be maintained. 5. Boards should try to create the legal framework to ensure the process supports student achievement before the Province entrenches its role. Committee work: I continue to work on the Special Education Advisory Committee, the Living Well Focus Group, the Audit Committee, the Discipline Committee and others. One other Committee with which I am involved is in the process of reviewing the Strategic Plan and establishing measurables for its successful implementation. Primary and Junior EQAO and Mathematics: The Board’s press release explains this issue best. “The Board received a report outlining that student achievement for primary (grade 3) and junior (grade 6) math has fallen over the last number of years. The report, citing the fact that the UCDSB has a goal of reaching a 90% graduation rate, emphasized that there is an established link between higher mathematics achievement and higher yields in graduation rates. Also, research on the results of EQAO’s province-wide assessments has shown that there is a relationship between early achievement and achievement in secondary school. 1. Utilize a networked professional learning model with a focus on mathematics. 2. Target student and teacher efficacy with a curriculum focus on patterning and algebra. 3. Dedicate resources to support mathematics learning and instruction. Trustees requested a report on the progress and success of this plan within several months. More information is available on my website: www.jjmcallister.com. 4. Broadcast of Board meetings: All meetings are available on video (BoardDocs on the UCDSB website) and, as of very recently, one now has the ability to watch only those agenda items which are of interest. The deliberations of this Board of Trustees are very thorough if not terribly exciting. Such is democracy at work. 5. Pupil Accommodation Reviews (the ARC process): This is the policy which Boards must use when re-aligning boundaries and/or closing schools. Policy 413 was reviewed at the last Board meeting in light of potential future applications. When should a school be closed and what is the process? Recognizing that this is very sensitive and political issue for our communities, enrolment is a key indicator in providing quality education to students. The question the Board is facing is this: “How pro-active should the Board be in terms of gauging public views and addressing future alignments? Do we follow or lead for the benefit of our students in certain communities? “BCI Parent Council is hosting an event on Thursday, May 2 - Movement for Improvement. It is a prelude to Mental Health Week and from a pro-active approach will include information (skills/tools) on youth issues for parents and our children, including bullying, suicide, addictions, self awareness/empowerment, etc. The event is funded through fundraised dollars from Parent Council, a donation from UCDSB Mental Wellness Committee, and PRO (Parents Reaching Out) Grant. There will be three presentations in all: one to Grade 7-10 students, Grades 11 -12 students and an evening presentation to all parents and interested community members. The evening show will be preceded by a spaghetti fundraiser for the Gr. 7 & 8’s. The evening session will be of particular interest to parents as various agencies and groups which support students will be present. Not to be missed! School activities: I attend as many School Committee meetings and school events as possible. Given that there are seven elementary and two secondary schools in Ward 4, it is an interesting task. I am pleased to read and follow the activities of our students in these schools on Twitter, Facebook and newsletters. Our administrators and staffs are so involved and committed to the success and well-being of all our students. Group meeting of Chairs of School Committees: I will once again be conducting in the early fall of 2013 a group meeting using the latest of technology to explore a few topics of mutual interest. Please stay tuned. Trustee Innovation Award: I was pleased to be part of the Committee which drafted a new award to recognize the creativity and the innovation of Board employees who are essential in any successful 21st century organization. The deadline for submissions is April 30, 2013. Labour Relations: I wish to provide you with some insight into this labour issue from the perspective of a Trustee and, notably, a Trustee from one of the two Boards which has brought a case against ETFO to the Ontario Labour Relations Board. It is rather ironic in that our Board (Upper Canada) fought Bill 115 and the Minister throughout the process before, during and after the implementation of this draconian piece of legislation. Thus, we all find ourselves in the mess. Our point paralleled the arguments of the unions: we wanted the Government to respect the free collective bargaining process. More importantly, we (the Boards of Education in Ontario) wanted, more so now than ever, to be equal partners in the discussions. Today, we have a new Premier and Minister of Education. A fresh start is in order. It is my hope that Premier Wynne and Minister Sandals will not allow this opportunity to escape but will seize the opportunity to involve Boards in the process as one of the equal partners in the search for a return to “normalcy”. My definition of normalcy is that teachers will be free to make independent decisions as to their time and energy commitments to extra-curricular activities AND that a process which respects free collective bargaining will be achieved. For more information, please refer to several blogs: http://chairofucdsb.ca and http://whoisinchargeoftheschoolhouse.com. “Save the Thousand Islands Casino” Committee: At a meeting of the Board on February 13, 2013, I brought to the attention of the Board an article in the EMC by the Deputy-Mayor of the Township of Leeds and the Thousand Islands, Heidi Conarroe, in which she advocates for the continued existence of the Thousand Islands Casino. The issue of the possible move of the Casino to another area has been generated by the recent privatization of casino operations in Ontario by OLG despite an 11-year presence of successful operations in this area. This potential impact on two of our municipalities (Town of Gananoque and Township of Leeds and the Thousand Islands) would be disastrous – 400 lost jobs, lost revenue for hotels, restaurants, stores, gas bars, not to speak of the $1.6 million per year received by each of these two municipalities = $3.2 million. The UCDSB has a large stake in this resource because we support economic viability and sustainable growth in our Strategic Plan and Living Credo which states: “We are responsible to the communities we serve. We pledge to work with local partners to strengthen our communities’ economic base by providing students with skills that business and industry require.” The stronger our communities, the stronger we all are. Bus Driver of the Year Awards: At a recent Board meeting, the following drivers were recognized for their high-quality service to our students which in turn helps improve student learning by setting a positive tone for their school day: Roger Stanley, Terry Nicholson, Carolyn Klitbo, Christine Lefebvre and the late Gary Duffield. As their stories unfolded, it became obvious that these operators placed their personal imprint on the job as evidenced by their compassionate care of students in their care. Congratulations! The focus for 2013 is building on successes, improvements and student wellness and achievement. Nine schools in Ward 4: I have visited each school in Ward 4 and have attended all but one School Committee meeting, some on several occasions. I am reluctant to name any one in particular but each community school, staff and student body is somewhat unique. There are two key words in that last sentence: community and unique. It is so obvious that each community supports its school via support, fundraising, donations, activities and parental commitment on School Committees. Each school is also unique displaying a variety of events, activities and program opportunities. Miscellaneous: I continue working on the following: Student Senate, Discipline Committee, Living Well focus Group, Accountability Framework Trustee Group, Ontario Public School Boards Association Policy Workgroup, Special Education Advisory Committee and others. Labour relations: This has been a very difficult period for all parties involved in the Bill 115 issue. The Bill has been passed and teachers are back at work. However, unfortunately, it is not business as usual. We can only hope for some measures by the Government to return the good will of employees in the execution of extra-curricular activities. Chair Pietersma and Director issued the following statements. "This has been a very long and difficult process. It is now time for everyone to come together to ensure that we are working for our students." "It is always preferable to reach local agreements that best reflect what the employer is seeking (school boards) and what the employees are seeking (teachers and support staff). We look forward to returning to 'business as usual' when our schools reopen on Monday (January 7). We will continue to work with our teachers, students, parents and support staff to offer the activities that support student learning…it's important that we work together to put students first." The Board has made the decision to keep all schools open during any labour disruption. While normal teaching and learning activities will not occur, students will be cared for in a safe environment. Customer Service to become an integral part of all employee skills and competencies with a system level learning plan created for all employees. Create a world renowned communication system that engages all employees, students, parents, and community at large. Create schools/worksites that provide a welcoming, inclusive, secure atmosphere for staff, students, parents and community. Servant leadership becomes the leadership model for the organization. All leaders, both formal and informal, are provided opportunities and supports to excel. There is a formal and informal recognition program for employees to recognize those individuals who demonstrate the qualities of service excellence. Maintaining a balanced delivery of the arts curriculum across all four areas of dance, music, visual arts and drama. c) Providing opportunities for students to participate in Arts activities as both artist and audience/observer. In support of the above recommendations, it is requested that the Upper Canada District School Board continue to support the Arts Charter, including a budget allocation of $300,000 per year. Trustees requested a follow-up report in the Spring. • There is a great deal of literature showing compelling evidence of the benefits of early learning. Not only do high-quality early childhood education programs benefit children, they also have positive impacts on parents and the economy as a whole. • Several studies show that the benefits of early childhood education far outweigh the costs. However, quantifying these benefits is not an exact science and results are likely subject to a large margin of error. • Given the unquestionable number of benefits that early childhood education can provide, it follows that more focus should be put on investing in, and improving, the system. Indeed, in most parts of Canada, there currently exists a gap between parental leave and the start of formal schooling, and the limited child care spaces that are available are often very costly for parents. • The federal and provincial/territorial governments provide some funding for early childhood education, and have taken some steps to improve the system. Still, public spending in Canada falls short of that in many advanced economies. While governments at all levels are in no position to boost program spending at this time given budget constraints, this is one area that they should consider making a high priority over the medium term, as their finances move back into balance. • Ultimately, investment in early education can help to address core economic and social challenges facing Canada. It can help reduce poverty, address skills shortages, improve productivity and innovation, and a host of other national priorities. Diamond Jubilee Medal recipients: In honour of the Queen’s Diamond Jubilee, many Canadians were honoured by this award. At the meeting of January 9, 2013, Chair Pietersma recognized those recipients who had been or are associates or employees of the Board. Miscellaneous: My duties have included attendance at many of the various school Christmas concerts, School Committee meetings, Board and committee meetings, the Student Senate and more. Appointments: I am pleased to welcome Ms. Marsha McNair as Principal of Athens District High School. Also, Mr. Rich Tamblyn has been appointed as Interim Vice-Principal at Gananoque Intermediate Secondary School. We wish these two leaders well in their community schools. I wish everyone a very Happy and prosperous New Year in 2013. A. Reminder of special teleconference for School Council Chairs and members in Ward 4 on Monday, November 26th at 6:30 P.M... I am hoping that this informative format will be user-friendly for participants. The meeting will offer two components – a Web-based video component, and a teleconference component. I will be your host. The Web-based video component will take place during the first half of the meeting, and will allow school council members, as well as the general public to watch live presentations by UCDSB staff and students. Topics presented will include student mental health, and the highly-successful student mentoring program Link Crew. Phone number and participant code will be sent shortly. The second component of the meeting will be a teleconference, which will occur immediately after the live video presentations, and is open to all Ward 4 school council members. Phone-in information will be available to participants shortly. However, the teleconference will continue to air on-line so the general public can listen in. Viewers will have the opportunity to e-mail any questions they may have regarding the presentations to john.mcallister@ucdsb.on.ca. These questions will be answered during the teleconference. The theme of the Summit was “Knowledge into Action”. This was a most interesting talk about his research with First Nation communities in British Columbia. Essentially, he discovered that communities which had self-unity and a connection to their past gained a collective control over their future. Specifically, the community factors involved self-government, fewer land claims, good education, police/fire services, a cultural facility, women active in local government, language awareness, etc. This type of community exhibited lower if non-existent rates of suicide. “Promoting culture and the construction of a strong sense of identity among First Nations youth will protect youth from the increased risk of suicide that haunts teens and young adults.” The transfer of such factors to non-aboriginal youth applies equally. A team from the York Region District School Board explained the partnership which they have developed to coordinate and integrate supports for children, youth, families and communities. A team from Limestone outlined their joint initiative between the Board and Hotel Dieu Hospital. This team described the implementation of the Mental Health Curriculum (6 modules in one week) in their Grade 9 Phy. Ed classes. This curriculum is based on the work of Dr. Stan Kucher. (Brockville) – The Upper Canada District School Board (UCDSB) will consider a recommendation from its Committee of the Whole to introduce a transition for the Perth Family of Schools to a grades K-6 and 7-12 model effective September 2014. Enrolment changes have resulted in enough space being available at Perth District Collegiate Institute to accommodate the grade structure change. Note: I addressed this issue based on my experience with two such similar initiatives that I am familiar with: The Gananoque and Athens Families of Schools. The key is the input from the Transition Committees and the Board team’s response to their concerns. If there is good communication, the transition will proceed well. The Board has now completed quite a number of these 7-12 transitions with good success. As a Trustee, I monitor these moves closely and pay more attention to the newly-constituted elementary schools. The Committee of the Whole recommended that the Board direct administration to provide a draft policy concerning the usage of personal electronic devices in classrooms and the school. This draft policy is to be shared with Committee of the Whole in April of 2013. Note: My comments at the Board table reflect the world we live in. Electronic gadgets are a reality and should be viewed as a tool not as a distraction. The Board motion proposes the formulation of a policy to address issues such as etiquette, optimal utilization in class, training and many more issues. The regulation was approved August 29, 2012 and requires school boards to establish a roster of occasional teachers ranked by seniority and to use that list when hiring teachers for both long-term occasional and permanent teaching positions. The Committee of the Whole recommended that the Upper Canada District School Board direct the Chair of the Board and the Director of Education send a joint letter to the Minister of Education outlining UCDSB concerns regarding Ontario Regulation 274/12 - Hiring Practices, and requesting that she rescind Ontario Regulation 274/12 as quickly as possible. Note: This regulation is part and parcel of Bill 115 and is complex. Bottom line for me is: a) We want the best occasional teachers in front of students; b) The Board must respect its own OT list and ensure that it is the best possible. In so doing, these teachers on our list must be given first crack at available jobs providing they have the proper qualifications and experience. I am particularly concerned about our young teachers who are qualified and looking for a foot in the door but yet, many have been waiting 1-6 years hoping for a position. I wish them success in finding positions. Our Board’s policy should assist them as much as possible. The Board and its employees find themselves in a period of difficult labour relations due to the actions of the Provincial Government. In order to provide as much immediate and open information to parents on the status of Co and ExtraCurricular activities in each school, a blog has been created entitled “Students First, Always” which can be found on the right hand side of the main UCDSB page. (Brockville) – The Upper Canada District School Board (UCDSB) tonight held a special public meeting to discuss the status of contract negotiations with the three unions that represent its teachers and support staff (Ontario Secondary School Teachers’ Federation – OSSTF; Elementary Teachers’ Federation of Ontario – ETFO; and the Canadian union of Public Employees – CUPE). Today marked the first day that the secondary school teachers’ federation could legally strike or stage other forms of job action and the Board could lock out those employees. As a result of that, the Board of Trustees discussed the steps it needs to take to ensure that schools operate safely, in the event of labour action. The Board passed the following motion: The continuing labour dispute between the Minister of Education and the unions representing our employees has placed us in the position that we are now in a legal strike/lockout position with the Ontario Secondary School Teachers’ Federation as of November 7, 2012. The Board takes the safety of our students very seriously. The Upper Canada District School Board authorizes the Director of Education to use the power vested in the Board to protect our students’ safety by closing one or more of our schools/buildings or by locking out the staff of one or more of our schools/buildings if the need arises. Despite the fact that the secondary teachers are in a legal strike position, their union announced last night that job actions will be delayed until 11:50 p.m. on Sunday, November 11th pending the status of contract negotiations with the provincial government. “It’s important to understand that we would only lockout employees or close schools/buildings if student safety is at risk. We would not use such a measure as a punitive tool. Such an action by our Board would be a last resort,” stressed Board Chair Greg Pietersma. Trustee Innovation Award: I was pleased to be part of the Committee which drafted a new award to recognize the creativity and the innovation of Board employees who are essential in any successful 21st century organization. “We wish to recognize employees who demonstrate innovative learning/operational strategies and ideas which impact their school, other schools, workplaces and the community in a positive way,” outlined Ward 10 Trustee Caroll Carkner. “Our trustees recognize that our employees in classrooms, offices, playgrounds, parking lots, meeting rooms, yards and elsewhere are finding creative ways to make their jobs easier and better for themselves, the students and their colleagues. Consequently, the trustees decided to launch this award to recognize this ingenuity and innovation,” she added. 1. The nominee must have demonstrated creativity and innovation in creating a technique, tool or other resource to directly or indirectly increase student or peer achievement. 2. In this innovation, the nominee must have worked above and beyond their job expectations. For example, an educational assistant may have created a technique, an apparatus, etc. to use with a special needs child to encourage her to learn a new skill, or an office administrator may have created a new way of doing a task which is easier, a time-saver, creative, more thorough. A teacher may have been innovative in getting students to read or a custodian may have developed a better way to maintain a building thereby making it a safer place. A principal may have created an incentive/technique which encourages students to be on time for classes/school. All employees of the Board and members of parent councils are eligible to nominate someone. The deadline for nominations is April 30, 2013. The nomination form, a list of frequently asked questions and the award’s purpose and criteria are available at http://www.boarddocs.com/can/ucdsb/Board.nsf/Public (Under the Welcome Tab, within the Upcoming Events section). There will be a contest to create/design the innovation award. The contest will be open to all secondary students in the Upper Canada District School Board as well as the T.R. Leger School of Adult, Alternative and Continuing Education. Transition to Gr. 7 – 12 in Perth Family of Schools: The Upper Canada District School Board will move ahead with plans to introduce a transition for the Perth Family of Schools to a grades K-6 and 7-12 model effective September 2014 as outlined above. Update on Accepting Schools Act: Tonight the Upper Canada District School Board received an update on Bill 13, the Accepting Schools Act, which is designed to assist Boards in creating safe, inclusive and accepting schools essential for student achievement and well-being. Coombs also clarified for trustees that the Accepting Schools Act is not simply “tougher consequences” for those guilty of bullying. Rather, the Board has several measures in place that are designed to prevent bullying and to assist with investigation of all reported bullying incidents. Those measures include Link Crew, a mentorship program where grade 12 students mentor grade 9 students to ensure they are safe, valued and supported. There is also the Board’s extensive Character Education program where students of all ages are taught the importance of honesty, empathy, fairness, caring, responsibility, perseverance, respect and resilience. There are also supports in place for the bullied, the bully and the bystanders. Excellence Canada – Healthy Workplace Award: The Upper Canada District School Board has earned a prestigious award for the quality of its health and wellness programs. Board staff recently learned the UCDSB had earned Excellence Canada’s Level 3 Healthy Workplace ® Award, said Penny Raabe, Cultural Development Project Leader. The award is given under Excellence Canada’s Healthy Workplace Progressive Excellence Program (PEP) ®, and signifies the UCDSB has achieved the third level of a rigorous four-level process demonstrating its progress toward achieving a successful and sustainable holistic healthy workplace program. Building on the solid foundation established at Level 2 (Planning) obtained in 2009, the UCDSB has achieved wide implementation of its strategic focus on a healthy workplace environment. The PEP ® program is the roadmap for Healthy Workplace Criteria, which consists of four levels of certification and recognition: Commitment (Level 1); Planning (Level 2); Implementation (Level 3); and Sustainability (Level 4). To earn a Level 3 designation and Canada Award of Excellence (silver level), the Board had to demonstrate there was a sound systematic approach to a healthy workplace with good results being achieved in key areas. Ø Programs have a synergizing focus (doing it together; responding with unconditional support to a need; student-based decision making). The Board demonstrated that its programs are not just “one-time events” but help make concrete progress to ensuring sustained success. The award was officially presented to the Board during a ceremony on November 14, 2012 in Brockville. At the request of Councillor Rob Smith, I made a presentation to the Elizabethtown-Kitley Library Board concerning the transformation of our school libraries into Learning Commons. We also discussed ways in which Meadowview and Lyn Public Schools and the E-K Library could be of mutual benefit. I will be meeting with a group of constituents from Front of Yonge to share progress and to listen to concerns. a) A Strategy for Concussions in Ontario: concussions are a serious and growing problem. Research shows that activities that require concentration can actually cause a child/youth’s concussion symptoms to reappear or worsen. Since 2003-04, annual emergency room visits for concussions have increased by 58% and children accounted for 38% of those visits. The goal is a multi-ministry strategy to build awareness about concussion prevention, identification and management, inside and outside of schools. b) School Food and Beverage Policy: This new policy outlines certain requirements and sets out nutrition standards for all food and beverages sold in schools. While there are a number of successes emerging from the implementation of this policy, there have been challenges at the local level, i.e. impact on revenue for cafeterias, procurement concerns and other student complaints. Ministry staff is currently working with school boards across the province to monitor the financial impact that the School Food and Beverage Policy is having on cafeteria operations. In Upper Canada, we are monitoring that situation closely and certain measures have been put into place to mitigate these challenges. Special teleconference for School Council Chairs, Principals and other members in Ward 4 on November 26th: I am hoping that will be simple for participants and will be informative. The format may a webinar, a teleconference or whatever the Communication and IT Departments of the Board conceive. I hope to focus on three areas: a) an overview of Link Crew (new student mentoring initiative which is excellent); b) the progress of the Living Well Focus Group (mental health) and c) an open forum for discussion by Chairs and participants. It should be interesting and informative. Living Well: Highlights focused on the progress of the Living Well Focus Group and the strategies in play to better serve students with difficulties in area of mental for whatever reason. Trustees examined such areas as new programs to raise awareness, removing the stigma, professional development for staff, school-based initiatives, etc. Of concern to Trustees was the need to have in place ways to measure the success of these programs. Many great events to support and promote mental health awareness are occurring at most schools. For example, our own Student Trustee Sydney Collard, a student at Glengarry District High School, was part of the “Empowered Student Partnership” initiative. This group of students adopts a philosophy of “students helping students” to raise awareness of youth violence issues. The efforts of these students were recognized recently by the Canadian Mental Health Association Award. I mention this as an example of similar initiatives happening in all our schools. Part of the Board’s campaign involves posters, speakers, partnerships, training for staff and much more. Several school events in schools are in the planning stages. Stay tuned. Part of my assignment involves liaising with the Living Well Group; consequently, I will be attending a one day Mental Health Summit sponsored by the Ontario Public School Boards’ Association. It is gratifying to note that all Boards today are working on this priority and many great ideas and strategies are available. I hope to learn more. Communications and Relationship Management Plan: The revised department and its plan contain a number of good elements which will improve communications with parents and the communities we serve. School websites, the Board website, the use of social media, the training of staff (emphasis on building capacity) and other issues were discussed. This program, as with all other Board plans, will be measured using key performance indicators. Pineview Public School: A rather chaotic parking, bus, car, pedestrian problem has been addressed and the project is almost complete. New signage, bus/fire lane, curbing, painted lines, sidewalk, fencing, etc. have rectified a dangerous situation. Kudos to everyone involved. I have asked to appear before the Athens Township Council to update everyone on this progress. Gananoque Intermediate Secondary School: Last week, GISS Intermediate classes welcomed representatives of “Invisible Children”, a children rights’ group trying to take down warlord Joseph Kony, a Ugandan militia leader. The talk and workshop supplemented intermediate studies about child soldiers and support curriculum work. Elizabethtown-Kitley: I will be meeting next week with members of the Township’s Library Board to review the Learning Commons in our schools (new approach to “libraries”). Other areas of discussion will be ways in which the Library and schools can work more closely together. Athens District High School: I attended the Country Fair (a very exciting event involving many interactive activities on the football field) and the graduation. ADHS is presently sponsoring a fundraiser featuring the sale of “Party Lights”. My website: I urge students and parents to visit my website (jjmcallister.com) which contains a great number of useful tips. Feedback is welcome. Change is coming. Though I have Facebook and Twitter accounts, they are underused. I plan to use these social media more to communicate more regularly about the happenings in schools. New North Grenville District High School: The official opening of NGDHS is scheduled for October 18th at 6:30 P.M.. The Key Communicators is a select group of UCDSB staff who will communicate regularly with influential and key people in the community. They will, in effect, be sounding boards to provide feedback to the Board, identify trends and help promote an accurate message. If anyone is interested, I would be pleased to submit these names. I am continuing to work on such issues as transportation, mental health, EQAO analysis, a webinar teleconference for School Council Chairs and members, my committee work and other issues pertinent to individual schools.